Is Trump good for oil markets? US markets have been speculating over a Trump presidency for long time now. And let’s face it, it has been a great journey so far. Stock indexes are standing at record highs and investors’ sentiment is just getting better and better. Most of us know that higher fiscal spending, tax reform and deregulation are at the core of Trump’s economic agenda. But that’s far from all there is to it. For instance, energy has been one of the most faithful sectors to the real-estate tycoon during his campaign. So… Is it Trump a good thing for US shale oil producers? Will prices continue to move lower? Well… As usual, it’s kind of complicated. First we should remember that crude oil are denominated in US dollars. From that point, we understand that a stronger currency will pressure crude prices as they become less competitive for investors. "Our companies can't compete with them (Chinese companies) now because our currency is too strong. And it's killing us," said Trump in a recent interview. Words says it all. 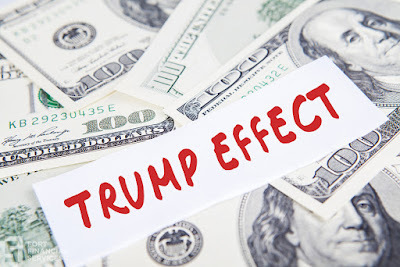 President Trump is actually determined to push down the dollar in order to promote American goods abroad, making them more competitive than others. As a result, oil prices could benefit from a wider demand and therefore move higher. However, the Trump team has shown support to the oil sector by paving the way for Dakota Access and Keystone XL pipelines, which are some of the most ambitious projects and have been under heavy scrutiny during Barack Obama’s term. In this context, oil service provider Baker Hughes reported on Friday an eight consecutive weekly increase of rigs operating in US soil. The US Energy Information Agency also said that crude inventories grew by 8.2 million barrels in the week ended March 3, beating once again market expectations and adding extra pressure on oil benchmarks. Some analysts believe Trump’s government is playing on both sides. From one side, it keeps a bearish approach when looking at the currency, but at the same time it bets on higher local production. Either way, a recent study showed that nearly 60 percent of traders is positioned for a bullish scenario rather than a bearish one. The question remains: what’s your side?